KITTEN WIRE: 11 KITTENS ADOPTED, WHO WILL BE NEXT? - KITTEN WIRE: 11 KITTENS ADOPTED, WHO WILL BE NEXT? KITTEN WIRE: 11 KITTENS ADOPTED, WHO WILL BE NEXT? OAKLAND, Calif. — Goodbye is the goal. That's the mantra in animal welfare work. And that's what I've had to tell myself all summer as tabbies, torties, mini-panthers, gingers and so many other balls of fur landed at Cat Town as part of our Forgotten Kitten Project. The risk of falling in love with a pet you foster or help care for at a rescue is a real hazard. Letting go is hard. But anyone you meet in this line of work will tell you that saying goodbye means being able to save more lives. One final snuggle session with Oak before sending her on to her new home. Photo by Cathy Niland. So that's why I'm thrilled to bring you this latest update, even if I write this with a heavy heart: Eleven of our young charges from this year's class of Forgotten Kittens graduated, finding loving guardians to take them home. And many other kittens have advanced enough to be available for adoption, having met key social milestones. These cats came to us during the height of kitten season, when Oakland Animal Services and other rescues were filled to the brims. Under-socialized kittens — those that didn't get enough human interaction during crucial early weeks — and those in need of specialized medical attention, have few if any opportunities before Cat Town. Leaf and her adopter at pickup. Photo by Marie Luise Klotz. There was Leaf, who cowered in a corner and hissed when anyone came near. Over time, and with the help of staff and specially-trained volunteers like me, she showed us she is a tender soul who was just patiently waiting for the right people to come along. There was Jennifer, a ball of energy who modeled confident behavior for her shyer bunkmates. They are among those who were adopted over the last few weeks. 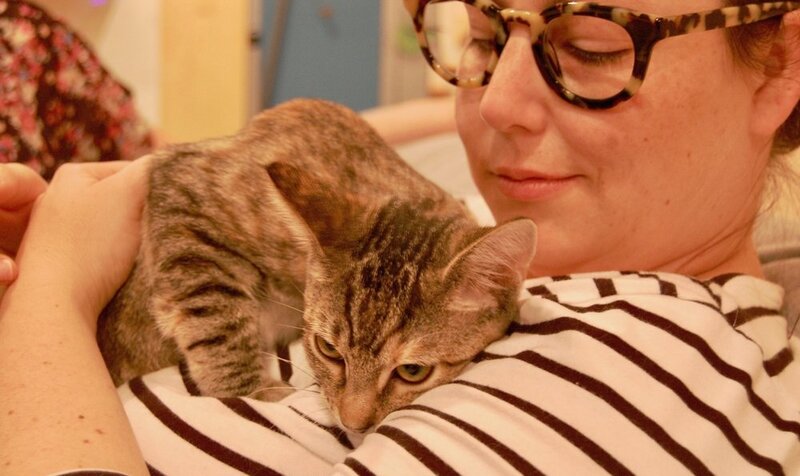 Jennifer (tortie) showing Mel, still available for adoption, the benefits of a good cuddle. Photo by Cathy Niland. We are so happy their new guardians found them and took a chance on kittens who were almost (!) forgotten. So, let me introduce you to this year's first batch of graduates: Angel, Adrian, Jordan, Morgan, Mango, Aspen, Leaf, Oak, Tulsa, Six and Jennifer. See their senior photos below. Who will be next to graduate out of the Studios at Cat Town? Maybe sweet Tofu, or spunky Mel, or beautiful Sheila, who is as loving and playful as they come. 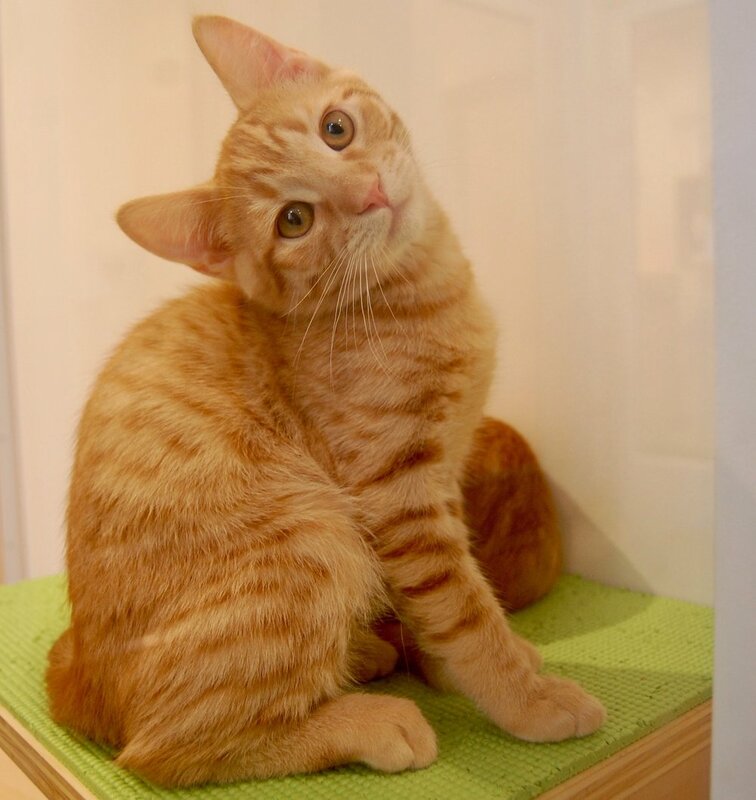 Email us at info@cattownoakland.org to set up a time to meet our adoptable cats and kittens. And if you want to support our life-saving work, consider a donation of any size. If you're feeling inspired by our Forgotten Kitten Project, we hope you'll consider donating by clicking the button below.